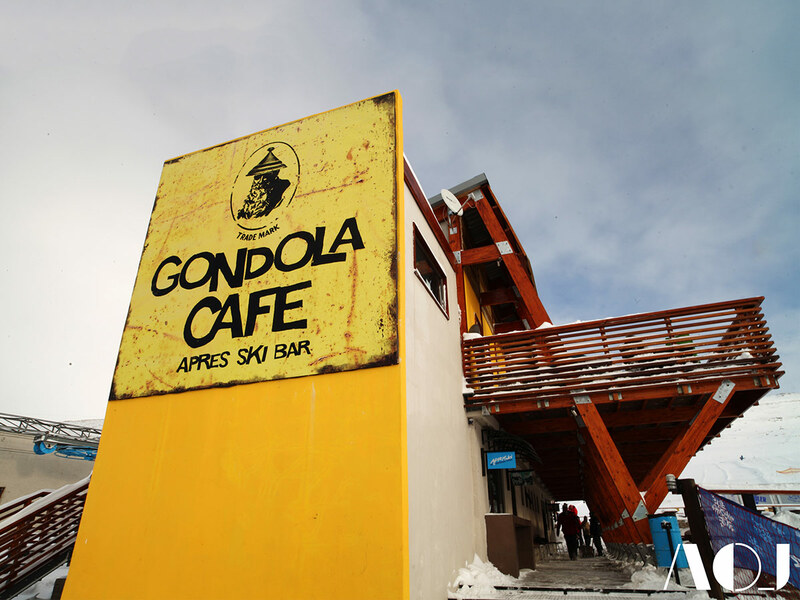 The Gondola Café is situated at the foot of the ski slopes of the Afriski Mountain Resort, located in the unspoilt natural environment of the Lesotho Maluti mountain range. 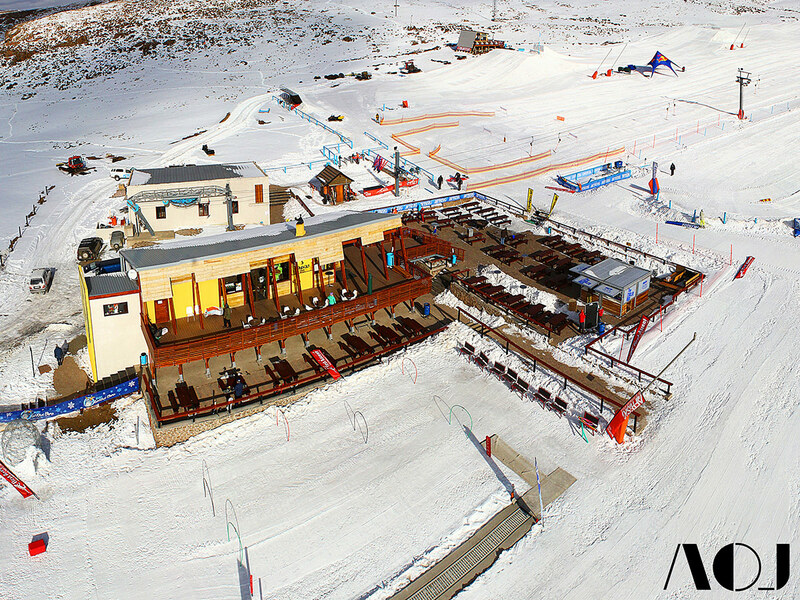 AOJ’s exposure to this unique place, and several initial discussions with the clients, made it clear from the outset of the project, that what the resort required most was a place visitors could relax between taking runs, enjoy a hearty meal at lunch time, and party into the early hours of the morning after a day on the slopes. 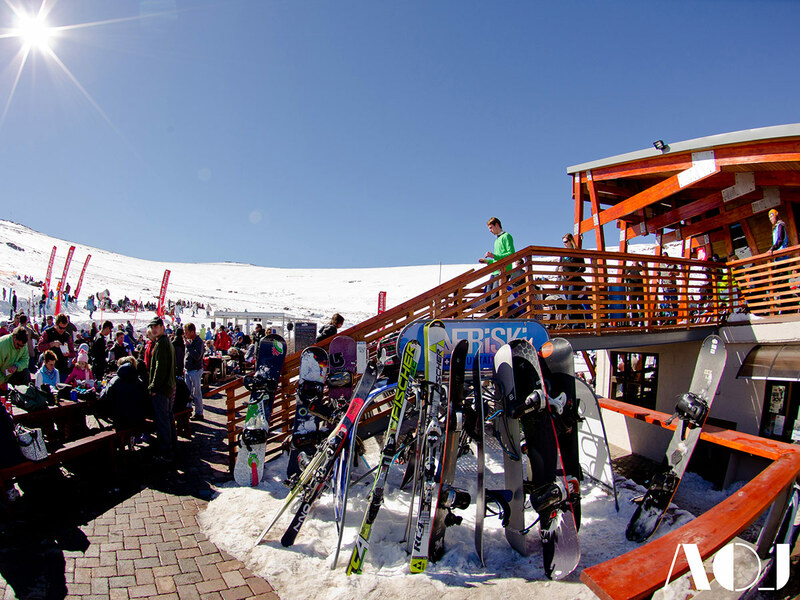 The clients also wanted to bring some of the European après ski traditions to the roof of Africa. In order to address this the AOJ team designed a predominantly timber structure which evokes the sense of a traditional European alpine construction. 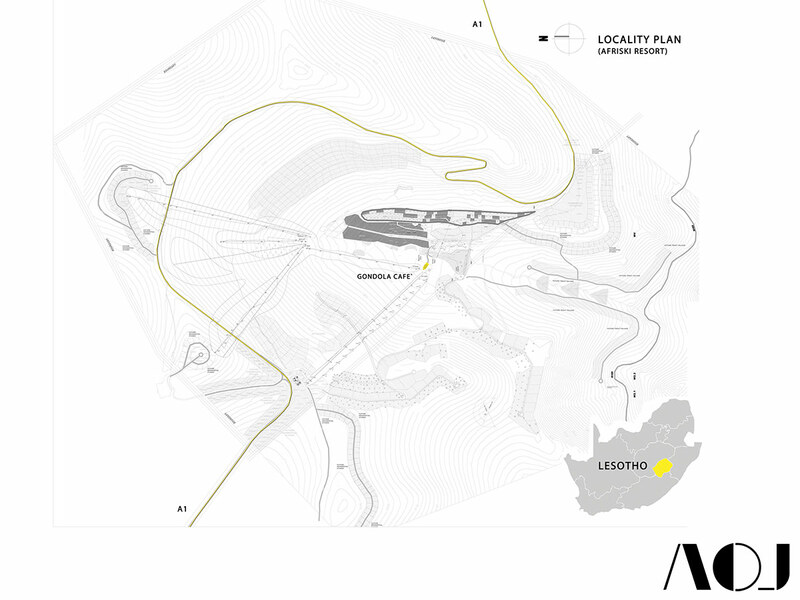 An existing ablution block, already located at the foot of the ski slopes, was chosen as the project site, and a brief for the new Café with viewing platforms and auxiliary functions was developed. 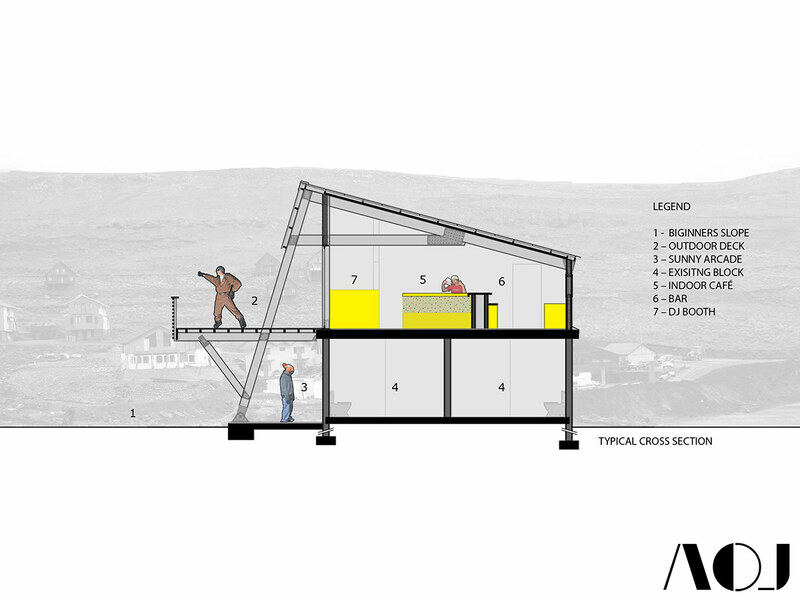 It was identified early on that building the new Café on top of the ablution block would be best as it would speed up construction, by making use of the concrete slab roof of the ablution block for a floor, and more importantly it resulted in elevated views toward and from the surroundings of the building. 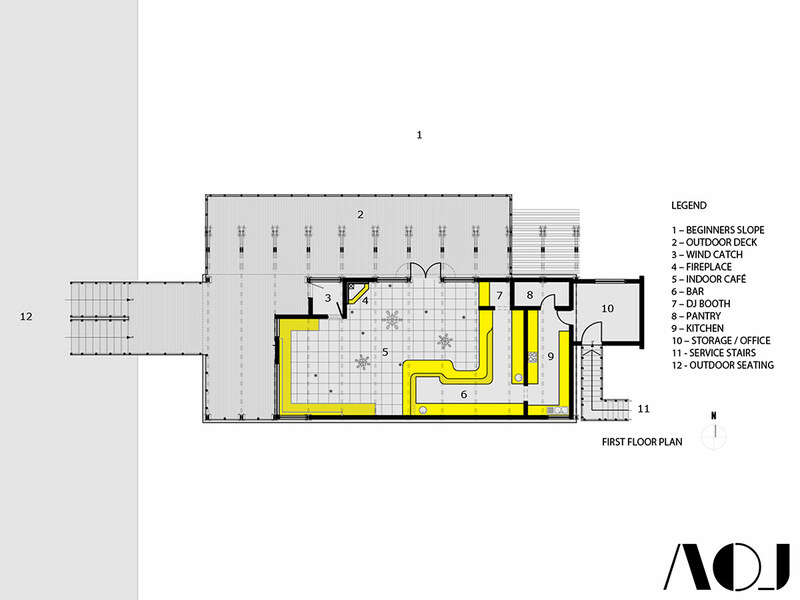 The Café is essentially an asymmetrical profile, shaped to minimise the southern façade of the building and maximise the northern one. 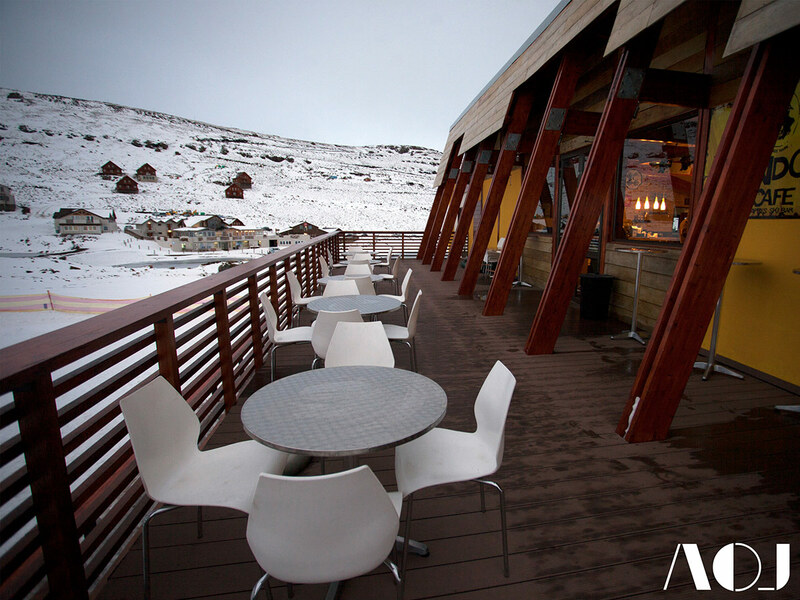 This reduces the need for excessive heating of the building in winter, despite the sub-zero temperatures at the resort, by reducing heat loss on the south and allowing sunlight to flood the building from the north. In order to further improve the thermal efficiency of the building the walls are made up of concrete filled polystyrene blocks and the roof is layered with Isoboard insulation and a moisture and waterproof barrier. 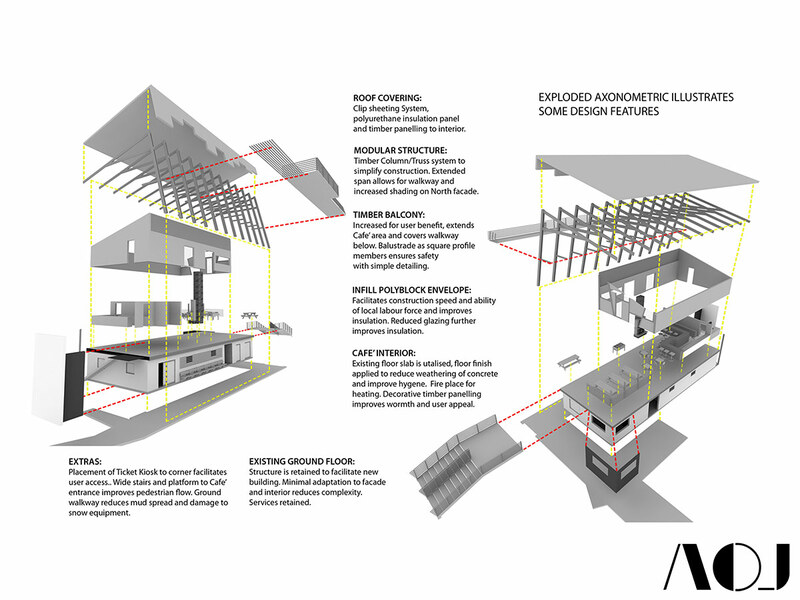 In addition to this, the asymmetrical profile is repeated in a modular timber and steel section that creates a uniformity and simplicity in the layout and owing to the way that it was designed made for non-mechanical handling of the structure during construction possible. 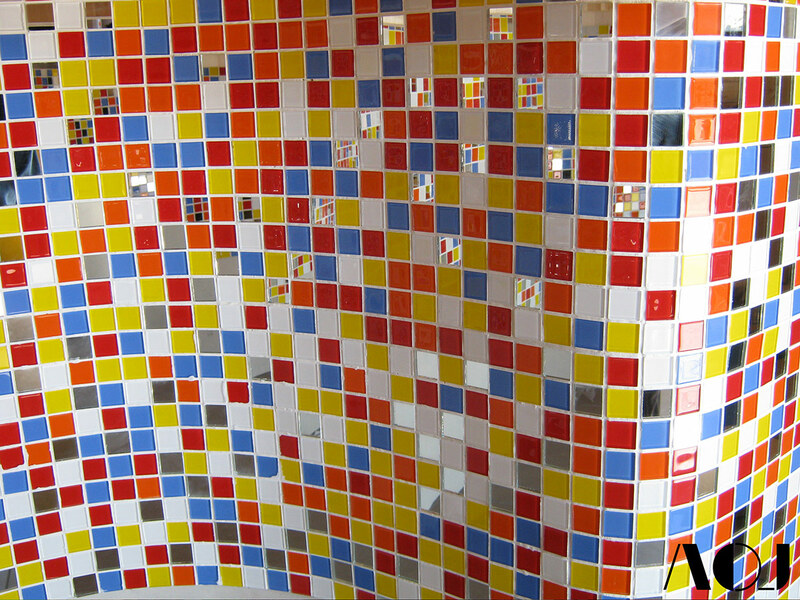 The interior of the café is a multi-layered, mixed use space. 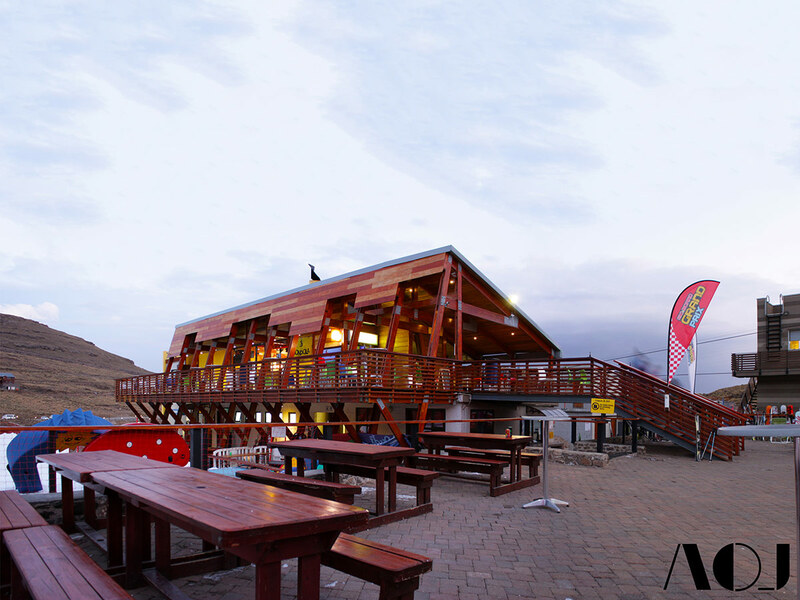 A juxtaposition of colourful elements and sandblasted timber, it acts as a morning coffee shop, a place to have lunch, an afternoon pub for sun downers and a nightclub. The use of yellow and natural brown colours to the exterior boldly contrast the snow covered surroundings, while further complementing the low lying afro-alpine vegetation in the summer months. On the upper north façade an open air viewing deck offers users a prime spot to take in the surrounding indigenous landscape and enjoy the sun with friends and family. 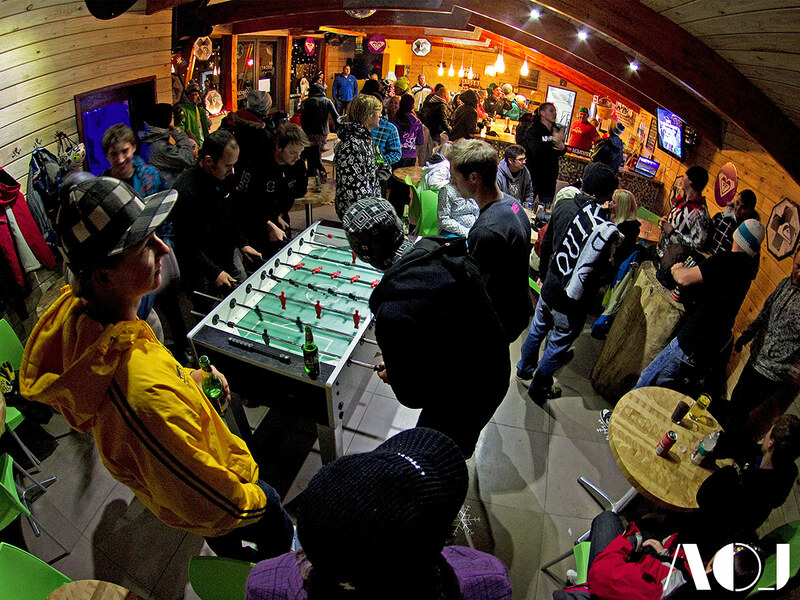 Below the viewing deck an arcade facilitates pedestrian circulation, and also further improves the functioning of the ski school, crèche and ski instructor’s office.